I am using internet by connecting mobile phone to my laptop using usb. From yesterday,my browser (firefox) shows for all most all website. Why this happen? How can i solve this? The date/time on your device maybe invalid. All SSL certificates have a start and end period. Certificates can be compromised and its a good practice to renew them. Your mobile provider might be routing everything thru a proxy server that is doing SSL inspection, so it can do content filtering or bandwidth optimisation, which Firefox is detecting as a man-in-the-middle attack. Not the answer you're looking for? 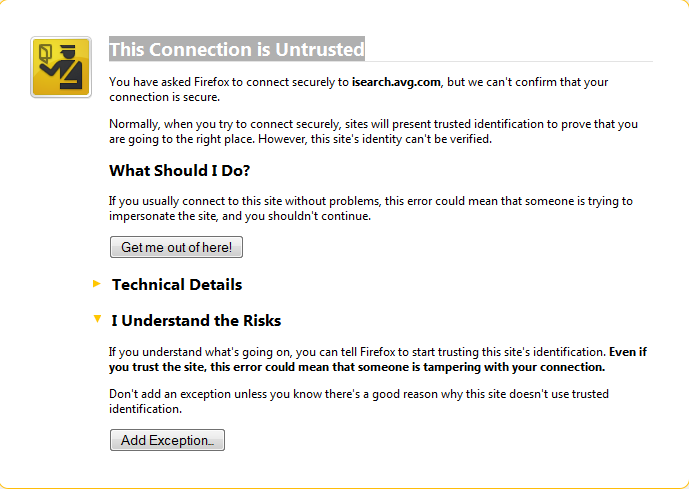 Browse other questions tagged certificate-authority firefox or ask your own question. Some http requests are not send encrypted by vpn! Why? Untrusted Certificate Not just on my computer?